We’ve been slowly working on our living room for nineteen months now. When we moved into this new house, the living room served as the main place to pile up boxes almost to the ceiling, and it was the chief area where the grans rode their new bikes with training wheels around and around, around and around. Then the boxes were eventually unpacked. And burned. In a fire-pit. With smoke billowing and flames leaping. In the back yard. But that is another story. Then the bikes went outside when the weather warmed. We kept making changes to the living room, then Michael and I would both pull chairs in there to sit, contemplating the next thing we wanted to do. The first thing we did in the living room was have a strange, arched, built-in glass book case in the wall filled in. Then the walls and ceilings were newly plastered. Then we painted the walls and ceiling. Then we installed crown molding. Then we bought a few items of furniture, one piece at a time. Then we had the living room’s beautiful hardwood floors (gasp) carpeted. Then we rolled around on the carpet, as is our family custom. The few projects left for this room are: order a fireplace surround, have window seat cushions made, get sheer curtains for the windows in the window seat, and hang the remaining pictures. Which brings me to today’s post, which could also have been titled,”One of these things is not like the other…,” which I think most of you can sing by heart from Sesame Street. We like birds in this house. Or maybe I should restate that – we, in this house, like birds. We don’t like to have birds in the actual house so much. Michael was devoted to birds long before he met me, and I have liked birds ever since a cardinal sent from heaven gave me much needed hope several years ago. We have this big space on one of our living room walls that I wanted to fill with some kind of art. I didn’t want a huge piece, and instead decided that I would get three or four matching pieces – maybe framed, botanical prints. Then when I was perusing an online art site, I found some neat bird prints that helped me decide we’d have an ornithological art grouping in the living room rather than a botanical one. They arrived last week and I’m very happy with them, with one reservation. I ordered them to be exactly the same size, so they can hang on this big wall space one right next to the other. The goldfinch is framed slightly smaller than the other two. I went back over my order and saw that it wasn’t my mistake, so I called the company and they cheerfully agreed to send me a new goldfinch, framed exactly the same size as the Eastern Bluebird and the Northern Cardinal. The company’s service is really fast; the new goldfinch arrived from California within four days, and….it was the same size as the original smaller goldfinch. Rats. I called again and they are working on another framed goldfinch print and assure me it will be the right size now. 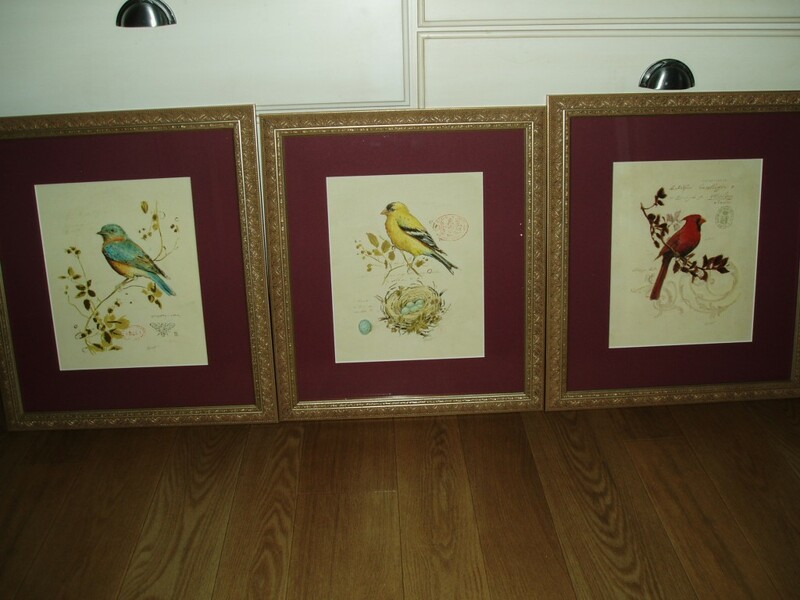 They are letting me keep the two smaller framed goldfinch prints free, for my trouble. But I don’t have a place for them in my house. Who needs three large framed prints of goldfinches, two a little smaller than the other? Should I put the prints out in the front yard with a “free” sign? Should I put them on Craigslist and see if there are any takers? 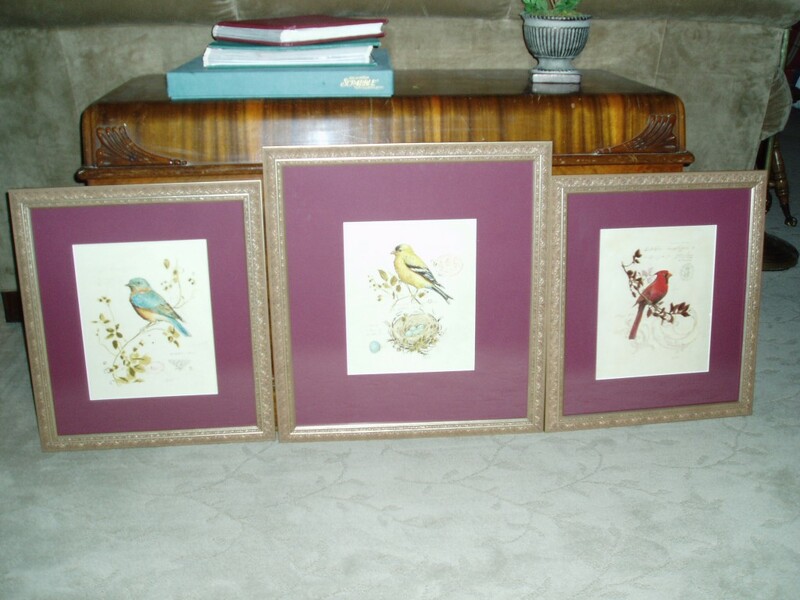 Or maybe someone reading this blog who is local and loves birds and has claret for one of their decorating colors would like them? Still no takers on beautiful goldfinch prints, framed and matted? That is hilarious Julie! I’m wondering if you sent these same pictures to your supplier? Maybe they can send you new prints of the bluebird and the cardinal that are larger. Eventually you’re bound to get a matching trio! Yes Deb! I sent photos each time! They could see exactly what I was talking about. This morning I sent another photo of the newest (huge) print, and how it doesn’t match the other two. I tried to spell it out like this: Please. Make. Three. Bird. Prints. All. The. Exact. Same. Size. And here’s the most frustrating part – they actually charged me for this newest behemoth goldfinch print! I know this wasn’t meant to be a humorous blog entry but I laughed out loud when I saw that last picture. Oh my goodness. I really hope you can get this resolved without shouting or pulling out your own hair. These things should not be this difficult should they? I’m sorry. I just laughed again when I looked back up at that picture. I actually did a spit take on the last photo! This has to be one of your funniest posts…or else I’m just in a weird mood today. I laughed out loud looking at those pictures. I’m sure it’s not so humorous for you, though! I do hope you get this resolved, but wow, are you ever going to appreciate those same sized pictures (if and when you get them!). That’s wicked funny. And terribly upsetting! And we need pictures in our living room!!! Are they all taken already?? You are welcome to one, Savannah, but the mat color isn’t purple. It’s claret, or a deep red – closer to burgundy I think I’d say. What do you think? Oh, I’m so glad other people found this funny too! Aunt Julie… this is really funny…. But guess what I have hanging above my couch?? The goldfinch, blue bird, and two other of those bird pictures. I found them at Bed Bath and Beyond. I have a red(orange) bunting, and another blue bird. You have no idea how much joy this brings me. Sometimes I wonder how certain things can be hereditary – like loving birds. It’s uncanny how much stuff seems to be genetic! 🙂 The older I get the more I love birds too – they bring me peace and joy to sit quietly and watch them. LY.